"Smooth" is what Wilson named this new driver. Based on their literature, the name mostly has to do with its smooth, mostly understated styling. With a head size of 460cc, this driver compares with most others in the current market, but it doesn't have much of a "wow" factor to really separate it from the others; "boring" could almost be used instead of "smooth" to describe it. That said, the club does perform well, and from that perspective ranks in the mix very nicely with any other big name manufacturer's driver offering. Wilson has installed some proprietary features on the inside of this club as well and, to be honest, unless you are a real tech-head, just believe they work and don't worry about the fine print. The Wilson Smooth Driver comes in a few iterations including both a right and left hand orientation and is equipped with a very solid-performer: a Fujikara graphite shaft in Senior, Regular, and Stiff flex. Lastly, loft options of either 10.5 or 12 degrees are available (see specific seller for exact shaft, loft, and hand options). 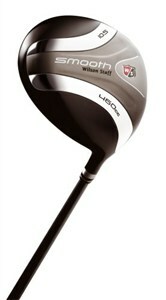 If Wilson is your "go to" brand, give the Smooth Driver a try. Compared to most others in the category, though, it'd be easy to pass this one by based on looks alone.